SNES Super Street Fighter II (USA v1.0) "Ken" in 11:32.43 by Saturn. Super Street Fighter II is a fighting game produced by Capcom, originally released as a coin-operated arcade game in 1993. 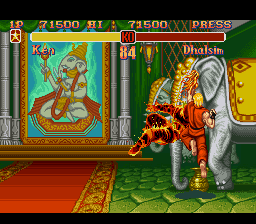 It is the fourth game in the Street Fighter II sub-series, following Street Fighter II' Turbo: Hyper Fighting. Ken takes the spotlight in this run. The author executes some impressive and shocking combos.